SINGAPORE, 29 January 2018 — Chubb today announced the appointment of Edward Ler as the new Country President for its general insurance business in Korea. Mr. Ler replaces Edward Kopp, who was recently appointed as the new Country President for Chubb’s general insurance business in Thailand. Mr. Ler joined Chubb in 2013 as Senior Vice President and Regional Head of Personal Lines, which includes oversight for Motor, Residential, High Net Worth and Specialty Personal Lines. During 2014-2016, in addition to his business leadership role, he was concurrently President Director for Chubb in Indonesia. Mr. Ler’s 15-year career in the insurance industry spans a variety of managerial roles covering the Asia Pacific, the Middle East and European markets. In his new capacity, Mr. Ler will continue to report to Paul McNamee, Chubb’s Regional President for Asia Pacific. 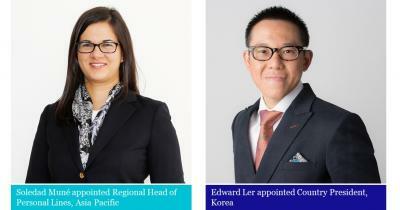 Succeeding Mr. Ler as the new Asia Pacific Head of Personal Lines, is Soledad Muné. Presently Chief Underwriting Officer, Personal Insurance for Chubb Overseas General, Ms. Muné is resposible for ensuring the continued profitability of the company’s international auto and residential insurance portfolios. With more than 15 years of industry experience in both U.S. and international personal lines businesses, Ms. Muné is ideally suited to this growing and dynamic market segment in Asia Pacific. In her new role, she will be based in Singapore and will report to Mr. McNamee and by matrix to Daryl Page, Division President, International Personal Lines, Chubb Overseas General. Both Mr. Ler and Ms. Mune’s appointment will be effective on 1 March 2018. Chubb is the world’s largest publicly traded property and casualty insurance company. With operations in 54 countries, Chubb provides commercial and personal property and casualty insurance, personal accident and supplemental health insurance, reinsurance and life insurance to a diverse group of clients. As an underwriting company, we assess, assume and manage risk with insight and discipline. We service and pay our claims fairly and promptly. The company is also defined by its extensive product and service offerings, broad distribution capabilities, exceptional financial strength and local operations globally. Parent company Chubb Limited is listed on the New York Stock Exchange (NYSE: CB) and is a component of the S&P 500 index. Chubb maintains executive offices in Zurich, New York, London and other locations, and employs approximately 31,000 people worldwide.